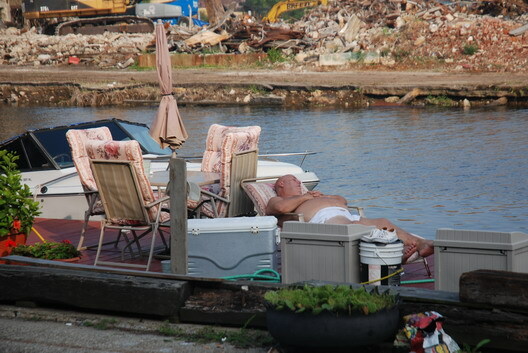 The demolition equipment that has been hard at work on the former Revere Sugar site being cleared by Thor Equities was silent at the time we found this gentleman catching some rays and some z's. He's one of the group of people that spend serious summer quality time with their boats docked in Red Hook during the summer. Their boats, outdoor furniture and signage juxtaposed against the Revere plant in its various stages of decay have always made for interesting images, though few of them quite as fun as this one.